Everybody loves a story about unlikely dreams fulfilled, and Tom Jones’ is a doozy. 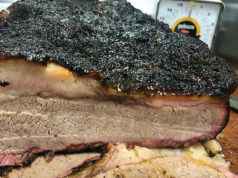 As explained on the Tom’s Burgers & Grill web site, Jones graduated at the top of his class with an engineering degree from University of Texas-Arlington but eventually became disillusioned with the high-salary sales job he landed after graduation. He wanted to work for himself, and he loved hamburgers. 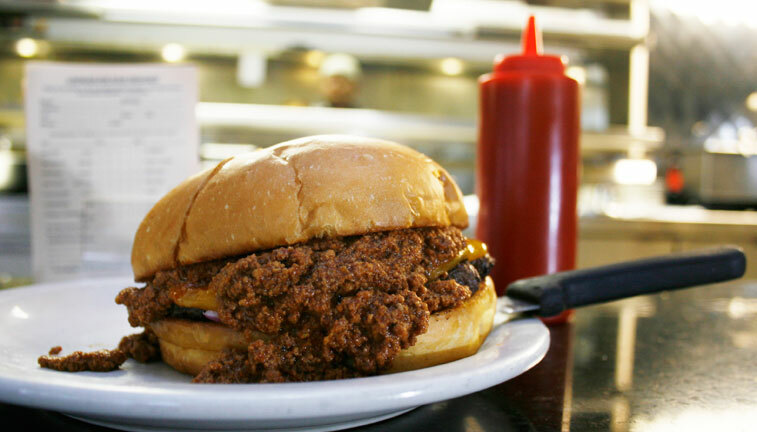 He and wife Jessica opened Tom’s Burgers & Grill after many months of researching North Texas burgers, sandwiches, chicken-fried steak, egg dishes, and other comfort food must-haves. Tom’s, located on the south side of I-30 in Arlington, is an old-fashioned diner that looks like a chrome passenger car and has an interior that’s sort of a cross between American Graffiti and Lost in Space: early-’60s-era soda counters, swivel chairs, and round puffy-seated booths accented with a kitschy futurist obsession with glass bricks and shiny silver surfaces. Tom and Jennifer refurbished what used to be a retro Denny’s location. Tom’s menu covers breakfast, lunch, and dinner. 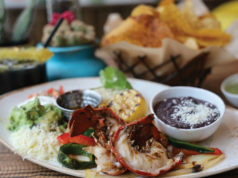 The appetizers here come in mega-portions and, if gobbled indiscriminately, are more likely to satisfy your appetite than pique it. From a long list of waist-expanding selections that included fried mozzarella cheese, cheddar- or cream cheese-stuffed jalapeños with ranch dip, fried mushrooms, and buffalo chicken wings, we chose the hand-battered onion rings and the bacon cheese fries. Each colossal ring turned out to be nearly as wide as a Tom’s burger, and the hot breading was a pleasing combination of crispy and lightly greasy with firm but tender onion slices. They were marvelous. The bacon cheese fries didn’t seem to get nearly as much attention from the kitchen. Though the crunchy, salty shards of bacon were generous, the fries were rather ordinary, thick spears with a thin glaze of melted cheddar. Upping the decadence factor with two or more different kinds of cheeses would have benefited the flavor greatly. On to the burgers. There are eight different styles, including hickory, chili-cheese, bacon-cheese, mushroom-swiss, and Southwest. 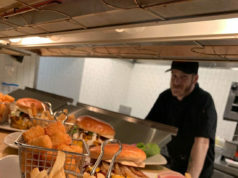 The beef patties, which are prepared over a custom-designed wood-flame grill that Tom added, are served in one-third-pound and half-pound sizes. I ordered a one-third-pound Southwest burger, medium rare. The server suggested I upgrade to a half-pound, as the patty would be juicier and actually retain some pink in it. She was right. Piled high with assertive smoked onions plus tender, sliced, and sautéed bell peppers; gooey pepper jack cheese; and a generous spread of garlic mayo in a soft-and-crunchy grilled French brioche bun, the Southwest was messy-great and dripping with beefy richness. The chicken-fried steak turned out to be one of the most original versions we’ve seen around these parts, and that’s saying something. The moist, pounded-thin steak was coated with crumbled, ridged potato chips, then deep fried until the coating was alternately dark brown and medium golden. Even beneath a steaming pool of pepper-flecked, non-lumpy cream gravy, the potato chip cover retained its crunch and delivered a delicious variation on a beloved state cuisine. The red potatoes on the side were also superb – the chunky spuds were only lightly mashed with pieces of red peel throughout, and they radiated the aroma of garlic and dill. Such small but significant details are what make Tom’s a silver-plated dream destination for Americana food fanciers. 1530 N Cooper St, Arlington. 817-459-9000.